The gear deburring machine TM1000-4-Axes-CNC was developed and constructed by Tecnomacchine in order to deburr and brush gears of larger modules. Workstation 1 is equipped with a burr shearer shich enables to shear burrs at the gear basis. Workstation 2 features two grinding wheels that chamfer both top and bottom of the gears. Workstation 3 is where the work part is brushed a the top and bottom by means of two brushes. Workstation 4 features an additional grinding wheel which deburrs smaller module work parts. 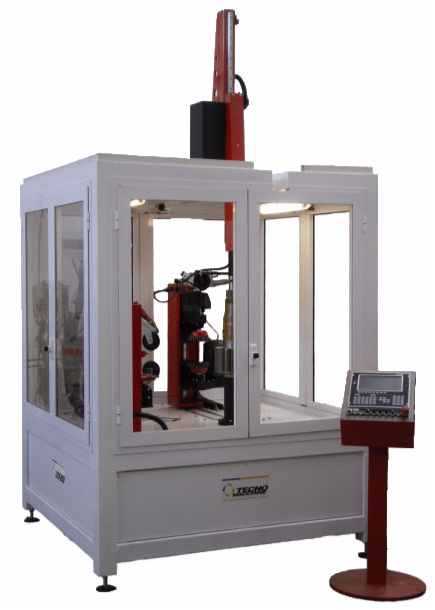 The extremely short set-up times contribute to the easy handling of the TM1000-4-axes-CNC.